MARVELOUS ESTATE HOME! This gorgeous home comes with curb appeal, wrap-around front porch, VERY spacious backyard and a three-car garage with RV parking. Enjoy making memories with family and friends in the serene country setting and still only five minutes away from the Five Freeway. Through-out the home you will find gorgeous Travertine and hardwood flooring, crown moldings and recessed lighting! Tons of upgrades throughout this spacious open floor plan with beautiful family room, large kitchen with brand new appliances, dining room, breakfast area and a fantastic first floor bedroom with full bath and first level laundry room. Upstairs features gorgeous master bedroom, two mini suites with their own bathrooms, large secondary two bedrooms and a bath. Build your own dream backyard here at this marvelous Hasley Estate Home! Bring in your horses, design your dream pool the way you want and anywhere you want in this spacious yard and much much more! 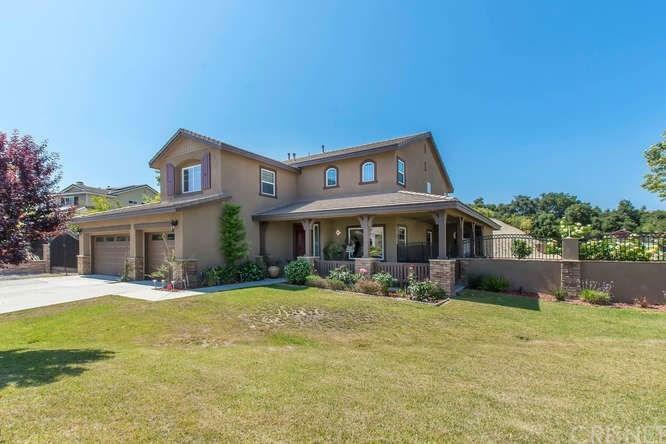 California Living at it's best... A little country yet close to all the Santa Clarita amenities!